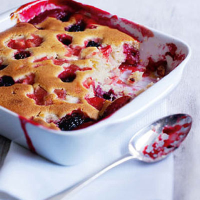 Sometimes only a pudding will do and this one can be cooking while you have supper, ready to eat fresh from the oven. It’s also great at tea time, or even for breakfast. Preheat the oven to 180˚C/gas 4. Grease a 1 litre ovenproof dish with 1 tsp butter. Put 60g sugar, the cornflour and 100ml water in a pan; stir to combine. Add the apple; put on a medium heat; simmer for 4–5 minutes, stirring. Take off the heat; stir in the blackberries. Sift the flour and salt into a bowl; add the remaining sugar; stir to mix. Whisk the egg, milk, vanilla and the remaining butter; add to the dry mix; stir until smooth. Spoon most of the fruit mix over the base of the greased dish. Pour the batter over, then spoon on the remaining fruit. Bake for 30–35 minutes, or until a skewer comes out clean. Cool for 5 minutes. Serve with a dollop of yogurt. This recipe is a great blueprint for using whatever fruits you have handy, depending on the season. Try it with pears and stem ginger; fresh or frozen raspberries and blueberries; chopped rhubarb; or stone fruits such as peaches, plums or apricots.